Think of it. Mile after mile and month after month—now it’s almost time to run your big race. When preparing for a marathon you sacrifice a lot for the euphoric feeling as you cross the finish line. In a few days it will all be over, but after so much training, you may still wonder how to best prepare right before your race. Cari Coleman, the Scott & White Galloway Running Program Director, works with runners every day and offers some tips. One of the most important things to remember is to relax and stick to what you know. Coleman stresses sticking to your training plan. “Trying anything new before a long run is not a good idea because you don’t know how your body will react,” she says. From what you choose to wear to your preferred running pace, come to race day mentally prepared to stick to what you know. If you want to use gels, hydration packs, shoes or inserts on race day be sure to test these out well before the race. This way you will know how your body responds, and you won’t have any surprises. For example, Coleman says if you try to wear a new pair of shoes you don’t know how your feet will react and may need to adjust the support. Runners can be particular about a style of running belt, the flavor of energy supplements, and even the type of watch or tracking system. As you prepare for a marathon, try to find what works for you on your longer runs. Experts suggest tapering your training about three weeks before the marathon. 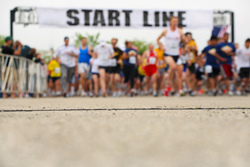 If you are following a running schedule, you will often be guided up until race day. Sometimes you may go out for a light jog, but one thing is for sure—you don’t want to burn yourself out before the race begins. You want to eat well two days before the race as it takes about two days before the food is ready to be used as fuel. During your run, your body burns protein as fuel so include some lean meat, poultry, or fish to your pre-marathon meal. However, the day before your race you want to go light on protein. Avoid anything that will upset your stomach and remember, stick with what normally works for you. Some good foods to eat the night before your race include whole grain breads, pastas and sweet potatoes. Then on the day of the event, if you need to eat, try to time your breakfast three hours before race time so everything can settle. The day before your race is the day to hydrate. Drink plenty of fluids, but the morning of the race, hold back. You don’t need to drink a lot before the race, and if you hydrated the day before, you should be fine. Runners say there is nothing worse than spending time in line at the port-a-potties along the course. As you run your race, there will be drink stations. The stations usually contain water or an electrolyte drink. Make sure you train with both of these types of hydration, possibly alternating, so you don’t overdo it on race day. You can also walk through the course ahead of time or find out when and where these stations will be. Before race day, it will be helpful to buy some fuel for recovery. Most runners suggest chocolate milk for their after-race drink, as it has a good blend of protein and carbs to help your body recover. Some races have healthy snacks for after you finish, while others have pizza and donuts. You’ll want to have a plan for what foods you want to eat after you cross the finish line. The night before your race, you don’t need to overdo it on sleep. Follow your regular body clock, and make sure you set your alarm for the morning. Set out everything so you can easily locate it. If you are traveling with others, perhaps it’s best to meet them later on so you can stay focused and punctual. Also, be sure to plan extra time if you need to drive, find a new location or if you’re unsure of road conditions. All of the time preparing for your run, and one bad day of weather can really make you worry. Look up the weather conditions ahead of time and so you know what to expect. In your training, consider doing a few runs in cold temperatures, hot temperatures, rain or even wind so you know what it’s like to test your body against the elements. Keep in mind the weather can affect your clothing, so be sure to dress properly for race day. On a cold day, some runners prefer to wear gloves or a long sleeve shirt they can just toss in the trash along the course, so they don’t have to worry as their body heats up. “To me running is 80% mental,” says Coleman. You’re almost there. Any physical preparation is worth nothing if you’re not mentally prepared. Take some time before your race to picture your success and before you know it, you’ll be crossing the finish line. 10. Get Ready to Run! With these ten tips and months of training, you should be ready to run! Get out there and do your best.